There is something about live television broadcasts like the Oscars 2017 that no movie nor TV show (scripted or “otherwise”) can compete with: the “anything can happen” factor. It keeps us coming back time and again to yearly events such as sports championships and awards shows. Most of them follow our expectations so closely that they fade into memory pretty fast, regardless of whether we were glad or sad at outcome. Remember all the big fuzz over Leonardo Di Caprio’s Best Actor Oscar win? Or the brouhaha over Steve Harvey’s Miss Universe flub? Can you honestly tell me, off the top of your head, who won the 2015 Super Bowl? (No “Google-peeking” for the answers!) The point is, we like the promise of watching live TV, although it seldom pays off. Every once in a blue moon, however, something as “predictable” as an Oscars telecast rewards your viewership with a moment so effed up it is worthy of become one of the films it showcases year after year. The 89th annual Academy Awards broadcast was such an event. The range of emotion and confusion that the Oscars 2017 provoked haunted my dreams. It has taken me a day to process it and ponder about its repercussions. Its ending retroactively made it what is possibly the best thing I’ve seen on television. Ever. This is one Oscar ceremony that will stand the test of time. And it all happened, as these things do, with a series of small, questionable decisions. They accumulated to create the worst possible outcome you can imagine at an awards show. Namely, the winner of Best Picture was incorrectly declared as (La La Land) and the real winner (Moonlight) was revealed during the loser’s acceptance speech! In case you decided (understandably) to skip the Oscars 2017 since you had no one for which to root, let me give you a recap. The masterful effort of director Barry Jenkins, as well as his cast and crew. The movie’s 8 Oscar nominations. The fact that, together with Fences and Hidden Figures, it represented the Academy’s answer to last year’s #OscarsSoWhite controversy. Before it all became about that infamous Best Picture moment, both films fared pretty well. La La Land took six of the 14 categories in which it competed. These were Best Costume Design, Best Original Score (Justin Hurwitz), Best Original Song (City of Stars), Best Cinematography, Best Director (Chazelle) and Best Actress (Emma Stone). Moonlight was no slouch, launching Oscar Night with a Best Supporting Actor win for Mahershala Ali (The Hunger Games: Mockingjay). It later won Best Adapted Screenplay (Jenkins, with story by Tarell Alvin McCraney, from his play In Moonlight Black Boys Look Blue). As for the rest or the Oscars 2017 winners? Tragic New England tale Manchester by the Sea got trophies for writer-director Kenneth Lonergan’s Original Screenplay, as well as Casey Affleck’s sad, subtle and Best-Actor-worthy performance. Hacksaw Ridge, the directorial comeback of Mel Gibson (after seemingly returning from the brink of insanity into the public goodwill, I suppose), won itself two technical awards: Film Editing and Sound Mixing. Thanks to her work on Fences, Viola Davis finally took home an acting Oscar, in the Supporting Actress category, which represented that film’s only win (hopefully she won’t retire her impressive nasal waterworks). 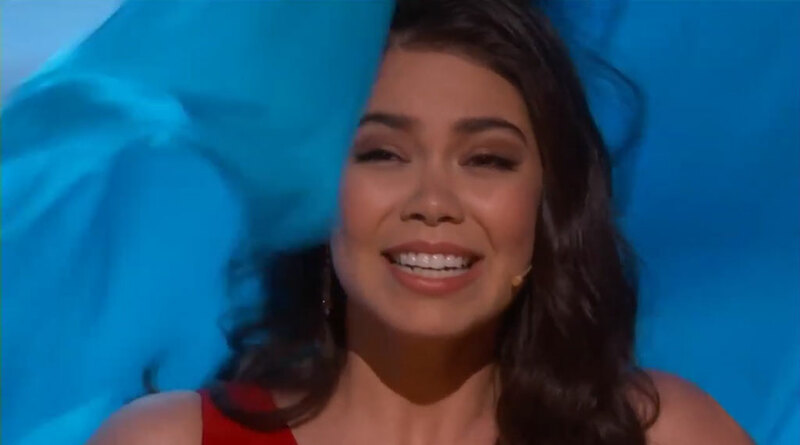 Even the ceremony itself was going without a hitch (accidental flagpole to the head of Moana‘s Auli’i Cravalho notwithstanding). Late night host Jimmy Kimmel was very Bob Hope-esque in his Oscar host duties. He keept things light and funny without getting either boring or offensive. The raunchiest he got was a comment on how depressing most Oscar nominated movies were this year: “The only happy ending this year was the one in the middle of Moonlight.” He immediately disarmed the seemingly shocked crowd at the Dolby Theater with a follow-up: “You didn’t see it, did you?” Highlights of his hosting tenure included frequent parachute drops filled with candy; a visit from real, unaware passengers on a Hollywood bus tour (two of which were “married” by Denzel Washington); and a surprisingly effective running gag highlighting a passive-aggresive (and fake) feud between Kimmel and actor Matt Damon. Then, near the finish line, someone dropped the ball big time and catapulted the Oscars 2017 into instant legendary status. 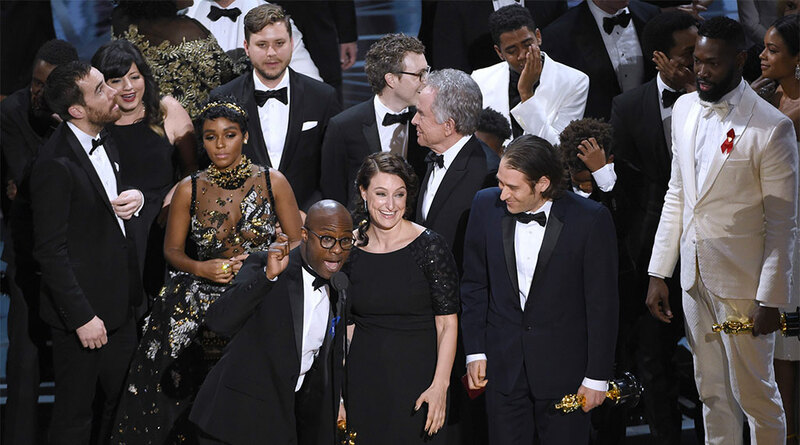 Plenty of media outlets and eagle-eyed we denizens have already given this moment an in-depth analysis, so an in-depth play-by-play is pointless (click here for some on-stage reactions captured by the Hollywood Reporter). 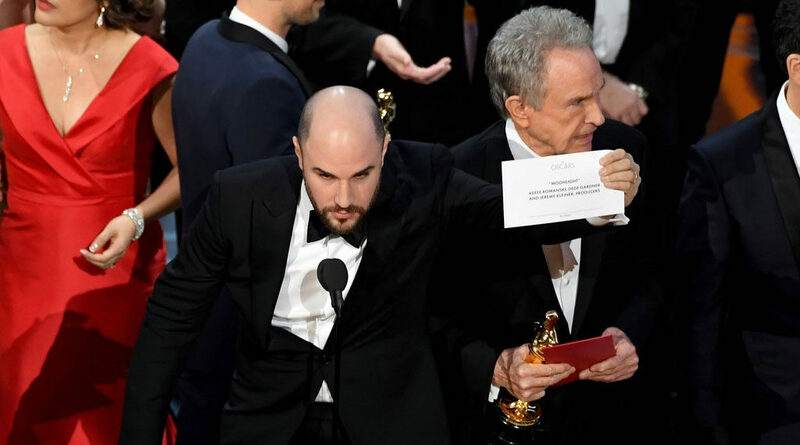 Basically, Bonnie and Clyde stars Warren Beatty and Faye Dunaway presented the Best Picture award, but were handed a copy of Emma Stone’s Best Actress envelope. Beatty noticed the mistake, didn’t know what to make of it and showed it to Dunaway. She, thinking he was being funny, read the movie on the card. The La La Land producers gave their emotional acceptance speeches, while the show’s producers scrambled to subtly inform them of the mistake. La La Land producer Jordan Horowitz then points to Jenkins and his crew telling them they won (“It’s not a joke!”), then showed the correct winner card for all the world to see. Thus the Academy Awards officially forfeit the right to look down upon the Miss Universe pageant ever again. You couldn’t have written this ending! There are no villains here, only victims. Beatty had no idea what to do and Dunaway just read what was on the card (Steve Harvey is feeling exonerated for sure). While the La La Land crew were obviously disappointed, they were very graceful about the whole thing. Even Kimmel tried to take the bullet for the disaster. (“I knew I was gonna screw this up!”) Reps from accounting firm PwC (PriceWaterhouseCoopers), which has secretly handled the Academy Awards vote tally from the beginning, apologized and promised to investigate further. As a film buff, I feel for the creators behind Moonlight and La La Land, both exceptional films. My heart goes out to host Kimmel, as well as the members of the Academy of Motion Picture Arts and Sciences (AMPAS) and every involved in the production of the Oscar broadcast. There were so many other important moments in this edition of “Hollywood’s biggest night”. An LGBT film won Best Picture for the first time, making up for Brokeback Mountain losing to Crash in 2006. 7 non-Caucasian actors got nominations this year. Two of them actually won and one of the was the first of Muslim faith to do so. Although Best Director did not go to an African American, it went to a 32-year-old, making him the youngest winner ever in his category. Their feats have now been eclipsed because of a gigantic blunder, the very definition of what the kids call an “epic fail”. But time will clean up this mess and all these movies, if worthy, will endure and win over more fans in the future. They have my sympathy, but as makers of story-based entertainment, I really hope the filmmakers affected by this fiasco find solace by appreciating their struggle and the bittersweet irony of the narrative they lived through. Hopefully, a long time from now, their story will make a great movie which will get an Oscar nom. Then, in a sort of cosmic callback, someone else will misplace their winning envelope. Now that’s entertainment! * AUTHOR’S NOTE: You couldn’t just leave it alone, internet, could you? The Hollywood Reporter and other sources report that the envelope mix-up has been officially attributed to PwC accountant and Matt Damon lookalike Brian Cullinan. He allegedly got distracted while tweeting about Emma Stone’s Best Actress win. Cullinan has been an Oscars regular for the past three years. As a fellow human being, I sincerely wish him the best. Click here for the full list of Oscar winners.